Unfortunately, I have flown to Dallas TX to deal with a family emergency with my ailing dad, so I missed a day of posting! I am not able to sketch this week, so I'll continue to post images done before. In 2013, I had the amazing opportunity to spend 3 months in Paris with the Gabriel Prize fellowship, awarded to one architect in the US each year. My project involved Versailles and the beautiful chateau Vaux le Vicomte, and of course I sketched many other things too! You can see lots more on my flickr page, but here are three of my favorites. 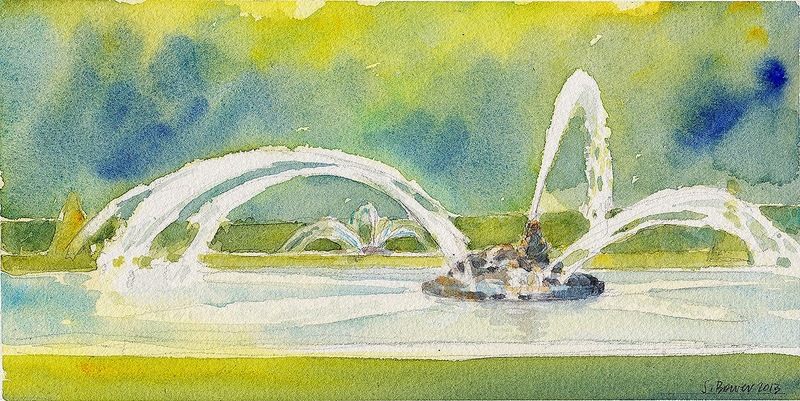 Thank you Paris Urban Sketchers for extending the opportunity to post as a blog correspondent and to Kim Marohn and Martine Kervagoret for becoming friends! And I now nominate Jane Dillon Wingfield to post some of her beautiful sketches!" The Paris city hall, Hotel de Ville. I walked pass this building often on my way home! Finally sat in a tree well and about a foot from the curb to sketch this. I am so honored that this sketch is also in Gabi's latest book! with the gardens all to myself in the early mornings.